Intelsat leverages its engineering expertise to offer satellite and terrestrial ground infrastructure “as a service” to customers looking to lower initial investment, reduce schedule and cost risks, and increase reliability and availability associated with high-quality design. If it is satellite related and on the ground, Intelsat can be your one-stop-shop allowing you to focus on your core products and services. We rank among the world’s leading teleport operators. We have spent decades developing and refining best-in-class processes and procedures, designed to maximize up-time and the overall customer experience. All Intelsat-owned commercial gateway facilities are serviced by triple-redundant terrestrial fiber paths, (provider-diverse wherever possible) significantly reducing the risk of downtime. From operations centers in Virginia and California, Intelsat engineers control more than 75 communications satellites in orbit high above the earth. These include Intelsat satellites as well as spacecraft owned by other communications providers. 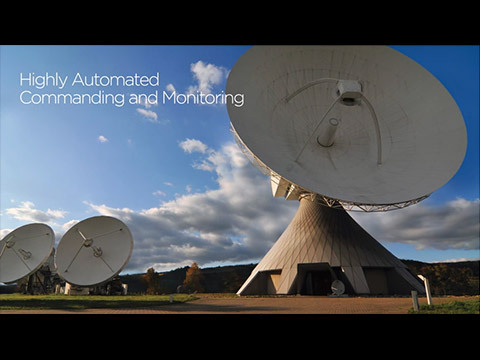 Combined with our global teleport and fiber infrastructure, Intelsat provides you with one of the most sophisticated communications networks in the world today.